The time has come for Sri Lanka to make all efforts to transform its advantage of speed and connectivity into a major logistics hub in the Indian Ocean which can have many positive spinoff effects in terms of becoming a more vibrant manufacturing, trading and export-based destination for global companies looking for new supply chain solutions. In a highly-competitive globalised economy, countries have their own Unique Selling Propositions (USP) and tends to focus on its core competencies and strengths to gain maximum returns to an economy to achieve greater prosperity. Some nations have given natural blessings, such as resources, geography, location and people, etc. At the same time there are nations that have been smart to create such advantageous position by using sheer strategy and intellect by being ahead of the competition and allocation of proper human resources to stay ahead of the curve. Among such smart nations today we can see Israel, Singapore, Japan and UAE as superior in many fronts in development and are world leaders and hubs in many areas of global industry. The greatest resources they have are leaders with out-of-the box thinking with the passion to see through reforms in a speedy manner to take the advantage first as technology evolves. If one looks at the two pictures above one would wonder, why Sri Lanka is still a developing country with a $4,000 per capita having nature’s gifts whilst the two major hubs Singapore and Dubai sitting east and west who had fewer natural resources became first world countries with over $50,000 per capita income. Probably the golden era of modern Sri Lanka was from 1977 to 1983 until the dark days of a civil war and terrorism ruined the country’s growth prospects. If one knows the history, Sri Lanka was a preferred destination to Japanese companies over Thailand to setup motor car manufacturing plants, Motorola was another company that was to enter the country during this period. Unfortunately, Black July in 1983 put a full stop to all those projects, and since then we as a nation has had difficulty in attracting foreign direct investment. Given all the difficulty the shipping sector and its transhipment growth continued to grow since the mid-1980s whenever we added capacity in the Port of Colombo started by late Lalith Athulathmudali. Even after much delays whenever we added new capacity (1999 and 2013) transhipment has grown. In my opinion Sri Lanka should have been handling 10 million plus TEUs by the end of 2018 instead of seven million if the right decisions were taken at the right time. However, lack of maritime sector policy reforms except operational adjustments for nearly three decades has kept the country out of the prestigious leading global maritime capitals list, whereas Dubai UAE which entered the competition just 20 years ago is listed among the top 10 maritime cities of the world along with Singapore. Mind you it is not the location that attracts Dubai, but the business environment created by its leaders. Sri Lanka can up the growth in logistics services as it has its unmatchable USP, which is a location that sits between two major global shipping, aviation, financial and logistics hubs namely Singapore and Dubai. These are complementary factors for our future logistics services and not competitors anymore in terms of logistics as both Dubai and Singapore have now reached a state of mature locations having new USP’s for their own growth. 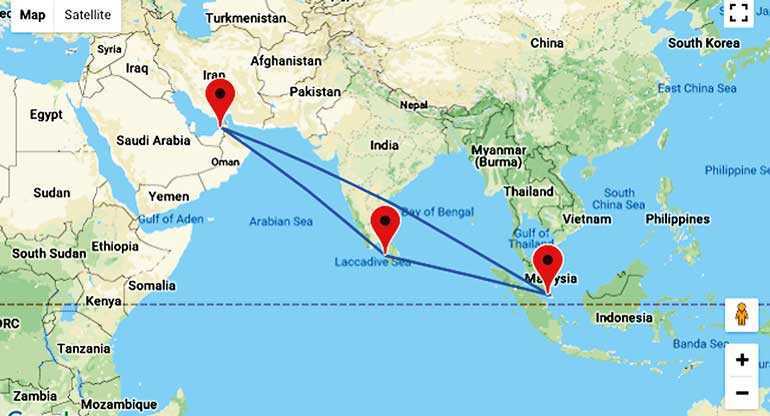 If one look at connectivity on the East-West trunk shipping lane, the vessel sailing time from Colombo to Dubai is five plus days and Singapore four plus days, and in the air, Dubai is four plus hours. And Singapore is three plus hours. What does this mean for connectivity from Sri Lanka? It has the unique advantage of linking both passengers and cargo to all continents of the world either via Dubai or Singapore in addition to direct services in a short time frame to from the Indian subcontinent. Dubai connects North America, South America, Africa, Middle East, Mediterranean and Europe with great frequencies by air and sea and on the East Singapore connects Far East, and North America and South Americas. Sri Lanka also has the unmatchable location in the Indian subcontinent and the Bay of Bengal region to service emerging large markets of India, Bangladesh and Indonesia for fast distribution by both air and sea. We are entering the third decade of the 21st century next year, whilst the fourth industry revolution is taking place with disruptive supply chains and consumer trends. Companies are increasingly recognising the need of its products and services to reach customers at fast speed to be ahead of market demands that is where logistics and distribution play a key role. 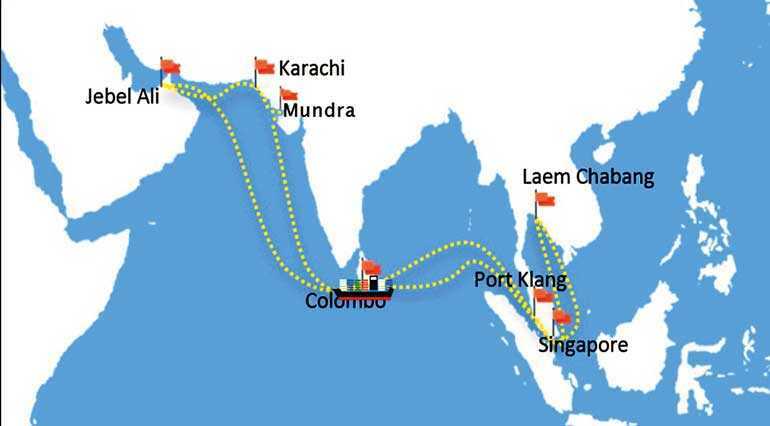 This is where Sri Lanka needs to focus and connect to global supply chains as the country is a relatively a low-cost destination than our two major hubs to hold stock, value add and service clients with the east west connectivity option in addition to reaching the Indian sub-continent markets. Many are not aware that the country has very flexible laws and processes to support such logistics services and provide options way beyond transhipment to clients globally. Services such a Multi Country Consolidations, air-sea transfers, entrepôt trade and value-added distribution services to global clients are already happening in a smaller scale but as a nation the focus and the marketing on the sector has been weak to say the least. This lack of focus not only comes from the Government, but the local business segments too are slow in identifying the gem of a location that can up the game for their own businesses. Sri Lanka’s true potential for shipping, ports, logistics distribution has not been developed into a bankable product by the stakeholders, yet many remain theoretical and ideological when promoting the destination. Mathematics has not been used for the modelling purposes which is the USP, which can transform the nation to a developed nation faster than we think if policymakers and the businesses have a better understanding of the subject of logistics and greater focus is given that will encourage global supply chain investors to look at the island more favourably over the other destinations. I write in the background of recent investment proposal of Saudi Arabia planning to invest $ 10 billion in Pakistan to build oil storage capacity for distribution, why not Sri Lanka? Simply we have failed to develop bankable solutions with capable people marketing the country, but time is again still on our side with an emerging India to the north, Sri Lanka can be the trading and logistics hub of the Indian Ocean once again. We should not wait for geo politics to decide the destiny of this country but proactive business models that are seriously developed to attract investors will help us increase FDI and new businesses. All regional players too will want to be a partner of a country that has definite business advantages in the global supply chain, then only we can move to become a financial centre, not the other way around in my opinion.